What makes a jab special and what does the jab do? The jab is quick, fast, and it sets up your shots. People with excellent jabs have calm and relaxed jabs that hit like a small spark of power and hit very accurately. Jabs can be made stronger by stepping forward, or using proper timing with proper footwork and effective angles. Your jab should be strong enough to stop your opponent in the middle of a combination. No more, no less. From there, your jab should set you up to throw your power punches. When used defensively, a jab can make space, keep your opponents away, and distract your opponent while you slide off the ropes. There are many different types of jabs and many ways to use the jab in boxing. Below are a few ideas to get you started but it’s best to use what works best for you. Regular – The regular jab or the standard jab is just that – a jab. To throw the jab from the basic position, step forward with your lead foot as you extend your arm out towards your opponent. As you recover your lead arm, the rear foot moves forward to return you to your basic stance. Unfortunately, a good jab will be hard to defend against. A jabber can be very difficult to get inside against, and at times downright annoying. Fighting a good jabber can be frustrating in amateur bouts since points can be scored even for ‘weak’ punches like the jab. Listed below are a variety of several ways to counter a good jab. Change Distance – One way to defend against the jab is to keep moving in and out of striking range. Boxers who often use the jab are usually very aware of the distance between themselves and their opponents. Right-Hook – This counter is effective against tall boxers or boxers who leave their head upright when they throw the jab. You can easily beat the jab by coming straight in with your body, bringing your head to the inside of the jab and throwing an overhand right to your opponent’s head. It’s a devastating counter and one that leads to many knockouts if your opponent doesn’t see the right hand coming. Again, the right-hand over the jab is one of the most devastating punches in boxing because it exploits your opponents’ blind spot. Parry to Straight-Right – This counter works best against boxers who throw a lazy jab or like to push a jab and leave it hanging out there. This counter-punch also works well when the other boxer tires and takes longer to recover his arms. All you have to do is tap down on the opponent’s hand, parrying it slightly down as you quickly come forward and throw a straight-right hand right over it. This counter requires you to be on your toes and have your body leaning slightly forward as you see the jab coming. Never Flinch – It is important that train to prevent the flinch reflex when the opponent’s jab is thrown. If you do that, it would be very easy for him to time your flinch movement, fake you out, and land a big punch later on. There are many theories to properly using the jab aside from the methods I’ve listed above. 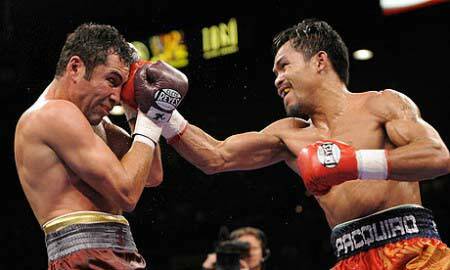 End with a Jab – Most fighters like to end their combos with a big right hand. The problem is that if you miss, your opponent could easily counter you. There’s an easy fix for this: end with a backstep jab. As you finish your combo, see if he’s going to lunge after you. If he does, pop him with a jab as you step back with your rear foot and leap away. The jab scores an extra point for you but also defends you from his counter right hand should he come after you. Jab Up and Down – That’s right. Jab to head, throw to body. Jab to the body and throw to the head. Light-Hard – Throw a light jab to his gloves and throw a hard jab through it. Throw a light jab to the body and hard jab to the face. Or throw a hard jab to the face and follow it with a quick light jab to keep his defenses up while you throw a hard right hand to the body. You don’t always have to throw a light jab, you could just fake a jab instead. Jab-right fake-jab – Throw a jab, fake a right-hand, and jab again. Jab- step back-jab – Throw a jab, step back out of range as he misses his counter, and quickly come forward with another jab. Sometimes, you can be so fast that he doesn’t expect it. Other times you can time it. Follow up with hard shots if he’s vulnerable. The jab clearly is the best weapon in boxing. It can hurt your opponent, defend you from a right hand, create space for you, push your opponents away, and even tear flesh off your opponent’s face. Practice it and use it. A good method to train would be to put little pieces of tape on your punching bag and jab at it to improve accuracy. As always, I welcome other great jab tips in the comments section. What about southpaws? How should an orthodox fighter use a jab effectively against a southpaw? And how should he defend a southpaw jab? When you jab a southpaw, there are several different “attitudes” or frames of mind you can use. – You can put yourself in a battle of reach. Many southpaw fighters do this to orthodox fighters so it does work if you do it back to them. What you do is stand sideways so that your left shoulder is in front of your head and you get a very long jab. Use this long jab to tag them from far away. This works well if have longer arms or superior timing. – Step right and jab. – When he jabs you, bend at the waist and jab to his right ribs. If the throws the left hand at your lowered head, quickly straighten your back (pulling your head out of the way) and whack him with your right hand. – You can also throw quick little left hooks that aren’t meant to land and then push out to a jab immediately after. If he’s not paying attention, he’ll go lazy once he sees that the left hook won’t reach, that’s when your jab immediately follows and pops him. how can i increase the angles at which i throw the jab. – aim at a different part of the body. You have the forehead, the chin, the chest, the stomach, the ribs, the ear. If you want to just distract him, you can throw your jab at the air, his gloves, his shoulder, his elbow. – move your own body before you jab. Step to the side, or dip at the waist, or pivot yourself at bit. I need help! I just started working at a gym where on one day during the week we run kick boxing classes all day. Some of the moves we are to teach have no instruction. One of them is called “Jab Flurries”. We are suppose to jab quickly with both the right and left fists. I teach clients to square the heavy bag and jab with both right and left. I’ve seen one other train with one foot forward. My thinking is if I right jab with right foot forward and then cross with my left – wouldn’t that be a right jab with a left cross(flurry!)? I seen one other trainer doing it that way and it doesn’t make sense to me. Help me please! That’s really weird. There IS such a thing as a right jab but it’s really just an unweighted fast right hand punch. The proper boxing stance is to stand with one foot in front, not a square stance. And yes, if you’re standing in southpaw position (right foot in front), it’s a right jab and left cross. I’ve never heard of any combo called “jab flurry”. If you’re throwing non-stop straight punches, then it’s just a straight punch combination. Some trainer’s will call it “1-2’s” because you’re throwing the “1” (a jab) and the “2” (the cross) over and over again. I think OP is referencing to speed drills on the heavy bag, where for 30 seconds you hit the bag as fast as you can, squared up. My trainer has me do it all the time. Goal usually to throw about 150-200 punches in that 30 second time range, with 15 second clock timer. 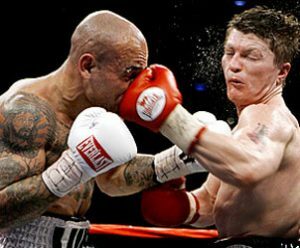 Very Interesting article on the jab Johnny, It gives a trainer or coach many different concepts for utilizing the jab. You have obviously had a lot of experience in the finer points of technical boxing and have really thought out the finer nuances of how to employ the jab in many different facets. I really enjoy insights. I have some more great technical articles to come on boxing fighting. I just mean his jab isn’t mentioned in the article. He had a great jab. Khalaf, Quartey definitely had a great jab. Very powerful very powerful. ive been trying so hard to get the jab down and its been very frustrating. everyone says i do it good but im a perfectionist haha. i really like that last tip you said about jabbing, stepping out, then jabbing again. it almost always seems to work against agressive fighters and people who try to counter. Great tips! @Devon – the step jab is king! I’m glad it worked for you. And you’re definitely a step ahead of the game in knowing that there’s always room for improvement. what about flicker jabs and othr specific jab? the flicker is a jab with the hand at the hip, thrown with the arm twisting so it sometimes lands with the normal clockwise turn from your viewpoint sometimes lands almost like a backhand on the speedbag. normal jabs spin one way. contrary to what some ppl think this is NOT just showboating it actually does cut, and it is harder to counter, because a guy can combine that punch with the feint and go to the body or throw a body shot instead. it has some snap behind it, and the worst thing it does is it cuts, and makes you look more dominant in front of judges. 1. put your left hand on your hip really loose. it cuts cuz facial skin hates being pulled up but is easier to pull down. thats why everyone suggests you shave with a downward motion rather than upward. this punch in particular is scratching leather across skin down to up (in an upward motion) and i believe that medically that’s the reason it caused cuts its tommy hearns’ opponents. its not a punch you can double up on or anything. the pivot jab-as you pivot on the left foot you jab to hit a guy going towards your right. you can also use it to deter him moving sideways. left hook specialists love this because ppl are always going to the right away from the left hook and can time the movement. 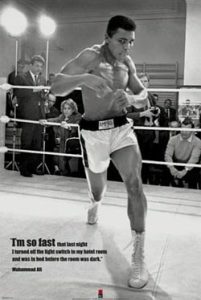 its much faster than modifying the jab or turning the body and jabbing. jabs dont carry power when youre pivoting to your right but amateurs use them. the jab-cross: it starts with a normal range finding or tap jab, and then on the second jab which follows almost immediately with the arm pulling back say 3 inches you put all the weight onto the front foot. this was called the heavy foot or the leading foot fall by oldtimers. basically practice the foot motion by stepping forward with the left rapidly without moving your right at all. your foot should catch you from falling, and on canvas or even tile it should make a huge sound, thats all the weight of your body falling on that foot. when you can coordinate that foot with the landing of the second punch, it has cross-like power. at the least it can stun fighters and if they dont know u can do this, you can score a flash knock down, getting a 10-8 round. its also kind of confusing to the other fighter whos probably gonna think you have more power than you do. theres the run away jab, as you back pedal, you can score a point, get someone chasing you offbalance or go def-off. while backpedaling, when you land the backfoot, instead of continuing backwards push you forward as soon as you land, move the front foot forward from the knee, land the jab, and use the front foot to push you back immediately. 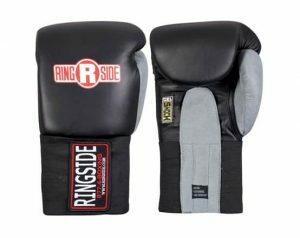 floyd uses this, pernell whitaker and pep. swarmers use a variation jab that comes from below, as they move in. we’re talking tyson or joe frazier style. as the puncher slips the right usually he throws his own jab which coming from below. and it can be followed by a right cross or a right hook upstairs. its quite unconventional, but u can see tyson, frazier, basilio landing this punch. i used this punch for variety, because the natural thing to do after slipping a right as you move in is a hook upstairs. jabbing when slipping the jab is possible i suppose one would only do it for variety. the real punch you want to throw is of course a body shot with your left hand. jabs arent magic u really need the imp 3-4. no fighter can use all diff types. but i think thats it for boxing and the use of jabs, ive even included the more silly ones. @amari – I’ve got to update this article. There are so many other jabs I left out. The flicker jab is like a backhand “tapper” jab with the elbows pointed sideways. Commonly used by long-arm fighters that don’t have muscle to really corkscrew each jab. Flicker Like Naseem Hamad with an illegal back hand at times. in some of your articles you mention hurting of wrists from bad form and something about arthritus if continuous pounding it may sound dumb to experienced guys but how are your wrists supposed to be when you punch and is there a safeway to punch? @newbie – your wrist should be straight when you punch. Punch light on the bag without handwraps or gloves and you will see what I mean. You have to punch with a perfectly straight wrist or else it hurts. So many more jabs to add. I’m going to have to update this super old article. May i get your opinion on this article? Good set up with the jab? It’s a great video of a great fighter, J. Definitely some good strategy, but not the only strategy. may i get your opinion if possible johnny? Those are legitimate boxing techniques, commonly used by many boxers. I’ve heard it called the up-jab or the vertical jab. It’s very commonly used, I wouldn’t make it your default but jab but it’s definitely effective and helpful in different tactical situations. You can throw more than two. ok so they can be different types of jabs? i realy enjoyed this article and it´s great to read, especially your exambles. Iám a tall guy and want to perfect my jab to the “ultimate” weapon:) So this week i will try all the exambles of the jabs you mentioned. This whole page is really amazing and iám happy that i finaly found it. It gives such a fun to read more and more and exercise it every week with a little succes. I bought also diffrent boxing technique books but you directly bring it to the point. Your article about the snap punch combined with the jab exambles will be my future work out for a long time:) Thank you and keep on going…..
I’m happy for you Philipp. Snapping punches and mastering the jab is definitely the way to go. Good luck to you. I never thought of a jab in the context of being a left cross. I’ll keep that in mind when I work the heavybag next. I read a tip in one of your other articles that talked about getting your hips into the jab by dropping them right before you jab, then using your legs to power into it as you pivot your lead foot. I tried it earlier, and it did give my jab more power and snap. Great tip. Big fan of the website Johhny looking forward to the next tutorial. Need a bit of advice. I am relatively new to sparring and the guy who I sparr against is an experienced amatuer with far superior technical ability to my own. The problem is every time I through my jab he seems to lean back and counter with his own jab, catching me almost every time. Should I automatically slip to the inside when i through my jab in anticipation of his counter or is there something more effective I can do? If he’s better than you, he will easily counter everything you do no matter what. His takiming will be better every time. There is no rule saying you have to slip this way or that way. The most effective way is to raise your skill level. The answer is not in the movement but rather, in the awareness of what is happening. Once you understand what’s going on: how & when he’s hitting you, you can respond in whatever way you want. whenever i jab my fist shakes during the end so my accuracy is not that good do u have any tips regarding this problem? More shadowboxing. Do the movement slow before you speed it up. How could a southpaw use the jab as an effective weapon against an orthodox opponent and a another southpaw opponent? Throw it! Different angles, different timing, different setups. How about the straight lead jab? The one jab that is similar to the Bruce Lee/Jeet Kune Do Straight-Lead punch like, the one Pacman is doing in the picture? And what about setup jabs that are designed for the 1-1-2 or 1-2-1 jab-cross combo? A jab is a straight punch from the lead hand. You can call it whatever you want but it’s all variations of the same thing with the same goal (striking the target). All the different names usually refer to the different ways of throw the jab, altering the elbow or fist angle, or even the trajectory of the punch. I listed the more common ones but in reality, there would be infinite ways to throw the jab. I am currently training in Seoul, and the trainer I’m currently with is insisting I should overextend my jab, into a straight left at all times. He says to do that and to work on speed? Can you give me some perspective on this please? Different coaches believe in different things. What’s important to know is that you need to learn many techniques to be successful, not only one. Since your coach knows that particular method well, at least you can learn how he does it and how he uses it. And then learn other techniques from other coaches to go with it. Generally speaking…there is no “wrong”, there is only “different”. i just started boxing and want to develop a powerful jab since i have long arms, at home i have been practicing my jab with a 5 pound weight in my hand, is this a good way to develop a strong jab? No, holding a 5lb weight is not a good way to work your jab. You develop a strong jab by having fast sharp timing and using a nice little step or dip of the hips to put body weight into it. Timing and accuracy. 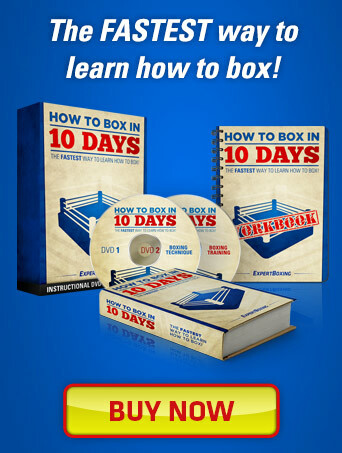 Do boxing only if you want to improve your boxing in the fastest way possible. Ive mastered a technique called the blinding jab. In orthodox stance, it is a normal, space maker jab but you throw the punch with your fist vertical. your thumb should be facing the ceiling. aim to move slightly to the left when throwing it and ensure that the jab hits across the opponents face as opposed to drectly on the front. The presence of the bulk of the glove in your opponents face makes it hard for him to see for a few seconds, panicking them making their next move predictable and, as you have moved to the side, you will appear to have disappeared from view momentarily. i have used this time and again to gain a quick advantage. I don’t get the rationale or purpose of the Tapper Jab. You said you use the tapper jab to put his defenses up so you can throw your harder punch. Why do you want to put up his defenses when it’s already down. Doesn’t make sense. It’s like saying to your opponent – put your hands up know because I’ll be throwing my hardest punch. It’s a form of strategy. You are using the tapper jab to make him defend SOMEWHERE, so that you can attack him SOMEWHERE ELSE. You are using your ability to manipulate his defenses to create vulnerabilities in your opponent. For example: making him block his face so that you may attack his body. He actually did include it in a separate article. When throwing the normal jab, stepping forward, should the step come first, like a split second before you throw the jab? Or vice versa? I’ve always had trouble with range when it comes to the jab, constantly missing people ( although that could be because I’m fairly predictable with my punches ) and I’m wondering if the footwork movement forward first would help in actually landing the damn thing.